Alexander Mayer, hailed regularly as a “modern conductor” by the media and praised for his innovative spirit and interpretations, has been Artistic Director and Principal Conductor of the Ensemble Symphonique Neuchâtel since 2010. Since then he has successfully established the position of this orchestra, created by a fusion in 2008, on Switzerland’s musical map, not least through appearances in renowned concert series and regular radio broadcasts. From 2013 until 2017 he also led the Sinfonietta de Lausanne to greatly recognized success. Alexander enjoys using contrasts and pushing through the boundaries of genres; he might, for example, make use of light shows during concerts, or combine Mendelssohn with electro sounds, or Beethoven with klezmer music. He has collaborated with such acclaimed artists as Gautier Capuçon, Tzimon Barto, Kolsimcha and the Swiss visual arts collective, Supermafia. Alexander also conducts evocative concert programs in his guest appearances, for example with the Orchestra del Maggio Musicale Fiorentino, the Orchestra Filarmonica di Torino and the Orchestra Sinfonica Siciliana, with a multifaceted repertoire which spans from Bach to Sciarrino. He maintains close musical relationships with the Orchestra Sinfonica Abruzzese and the Zuglói Filharmónia Budapest. 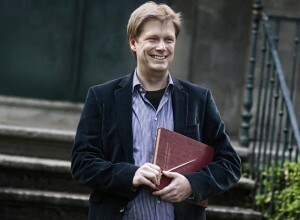 Alexander studied church music and orchestral conducting under the tutelage of Leo Krämer and Max Pommer at the Hochschule für Musik Saar. He has participated in master classes with Neeme Järvi, Gennady Rozhdestvensky, Frieder Bernius and Stefan Parkman, and has assisted the conductors John Nelson and Donald Runnicles. In 2003, he won the Tokyo International Music Competition for Conducting. Along with his activities with professional orchestras and choruses, Alexander is Principal Guest Conductor for the Saar State Youth Orchestra, is passionately committed to musical education, teaches privately, and regularly performs as organist and chamber musician.